Thanks to support from BHP Billiton Mitsui Coal, schools and community groups can uncover fascinating facts about megafauna in a new suite of learning resource kits developed by the Queensland Museum Network. Megafauna lived long after the age of dinosaurs – during the Pleistocene Epoch – 2.6 million to 11,000 years ago. The name ‘megafauna’ is a combination of Ancient Greek and Latin for ‘large animal’. In the Northern Hemisphere, megafauna species included the woolly rhinoceros, woolly mammoth and sabre-toothed cats. Australia’s most recognised megafauna are Diprotodon, a gigantic wombat-like marsupial the size of a rhinoceros, the giant lizard Megalania, and the giant sloth Palorchestes. 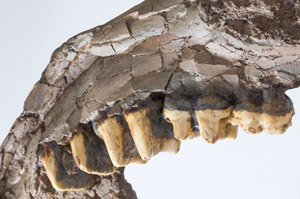 Dozens of fossils, from tiny fish scales to giant limb bones of extinct megafauna have been uncovered from the South Walker Creek mine site operated by BHP Billiton Mitsui Coal (BMC). 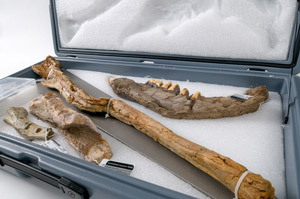 The new megafauna kits include stunning replicas of fossils uncovered from South Walker Creek and tools used in palaeontological and archaeological digs. The kits also demonstrate the collaborative nature of mining by profiling people involved in the South Walker Creek site, including award-winning palaeontologist Dr Scott Hocknull, BMC staff and Traditional Owners of the land. The megafauna learning resource kits are now available for loan from the Queensland Museum Network Loans Service, which operates a subscription-based metropolitan service from Brisbane and a network of 29 regional distribution centres across Queensland. QM Loans has two new discovery kits available for regional Queensland schools that align Aboriginal cultural material in the Queensland Museum collection with the new Australian curriculum. 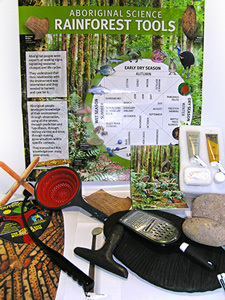 Aboriginal Science: Rainforest for years 2 and 4 explores the mastery of science by Aboriginal people in rainforest areas in north-eastern Queensland. This is the first of its kind to link Aboriginal traditional knowledge of chemistry, physics and biology to the science curriculum. Aboriginal Technology & Trade explores traditional Aboriginal trade routes and shows how the value of natural resources changes when resources are not available locally. This kit links to the upper primary history curriculum, as well as chemical sciences in the years 4 and 7 science curriculum. To find out when these kits are available in your local area, please click here. These loans kits are proudly supported by BHP Billiton Cannington.